This is my first draft of the digipak. I have decided to create a dark theme by keeping all of the colours throughout the pictures in the digipak dark. The front cover I have chosen is a puddle which I used to relate to my digipak design. I'm not too sure if I'll keep it because it doesn't really capture the image that I wanted to see. The back cover I feel okay with, I like how I have laid everything out with the picture of the band in the background. My left cover is the logo, however since I wanted everything to stay with a dark theme I decided that I would invert the whole image, making it black with white text. 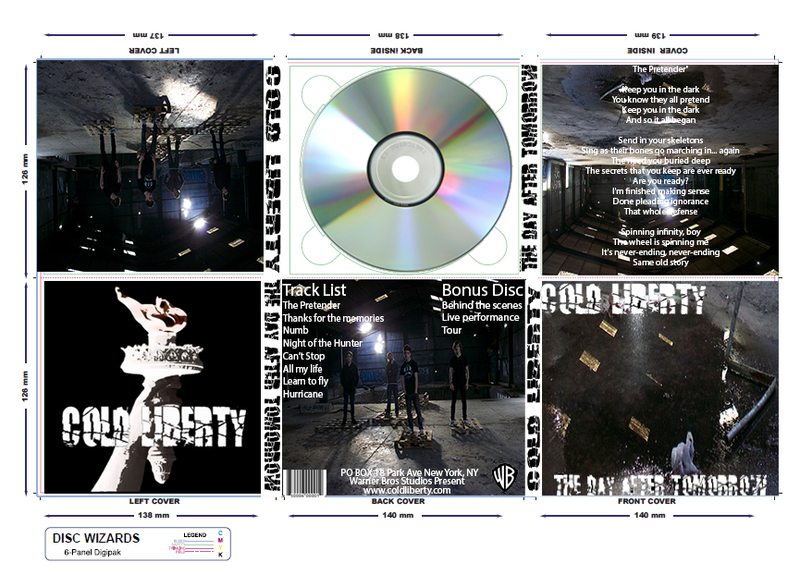 Then for the rest of the text used in the digipak I decided to make them all white so that it would link. My cover inside I think is fine with the lyrics going down it. The only part I disagree with at the moment is the disc. I am still trying to find a way to make it look similar to the one I did for my digipak design. My left cover is looking a bit plain, so I might also do something to that as well.